From Interstate 95, take Route 29 north. Follow the signs to the park. The park supports an interesting assortment of plants including mixed hardwoods, red cedar forests, plantings of Eastern white pine, Japanese larch, Norway spruce and red pine. A splendid variety of spring and summer wildflowers can be found throughout the park. Among the most notable species of wildlife are whitetail deer, fox, raccoon, great-horned owl, screech owl, red-tailed hawk, red-shouldered hawk and Eastern bluebird. The park also is popular for picnicking and, in the winter, for cross-country skiing on existing hiking trails. Open daily 8 a.m. to 7:00 p.m.
Park Office: Monday through Friday 9 a.m. to 3 p.m. Visitors Center Museum: Open daily 9 a.m. to 4 p.m. The Downtown Performing Arts Center of Lambertville, NJ is proud to announce a newly formed partnership with Washington Crossing State Park in Titusville, NJ. Beginning in May and continuing through September, the Downtown Performing Arts Center will produce a full season of live theatre for adults and children at the Park’s historic Washington Crossing Open Air Theatre. Along with Mainstage and Children’s Theatre series of plays and musicals, the schedule will also feature several theatrical concerts. The Center's exhibit galleries explore the many facets of America's revolutionary conflict with an emphasis on the military campaign known as "The Ten Crucial Days." The events of these ten days, December 25, 1776 through January 3, 1777, include the Continental Army's crossing of the Delaware River and the Battles of Trenton and Princeton. The Center is open Monday through Sunday 9:00 am - 4:00 pm, year round. For more information, call (609) 737-9303. Check the Calendar of Events in Nature's grapevine for current programs offered by the Washington Crossing Visitor Center Museum. The Swan collection represents a living military history laboratory of the American Revolution. Over 700 original objects interpret the era, circa 1745 through 1789. Open Monday through Sunday 9:00 am - 4:00 pm, year round. For more information, call (609) 737-9303. This early 18th-century gambrel roof farmhouse and tavern near the Delaware River was owned by Garret Johnson, who operated a 490-acre colonial plantation and a ferry service across the river in the 1700s. The house was likely used briefly by General Washington and other officers at the time of the Christmas night crossing of the Delaware. The keeping room, bedchamber and textile room are furnished with local period pieces, probably similar to the furniture used by the Johnson family from 1740 to 1770. The site also includes an 18th-century kitchen garden. Living history demonstrations are frequently held on weekends. Check the Calendar of Events in Nature's grapevine for current programs offered by the Johnson Ferry House. Please call the Ferry House for further information on their Fall schedule at (609) 737-2515. Open Wednesday through Saturday 10 a.m - noon, 1 to 4 p.m. Outdoor nature education programs are offered for schools, youth groups, community organizations and visitors to the park. Open Wednesday through Sunday, year round. For information, call (609) 737-0609. Check the Calendar of Events for current programs offered by the Interpretive Center at Washington Crossing State Park. Keep up to date of what is going on at Washington Crossing State Park by downloading the latest edition of Nature's Grapevine. Find out more about our programs offered specifically for groups, such as schools, scouts, clubs and local organizations. NJ Student Learning Standards by Nature Center programs for NJ teachers. Located within the park, on the same road as the Interpretive Center, the John W. H. Simpson observatory is operated by the Amateur Astronomers Association of Princeton, Inc. The observatory is open Friday nights April through October from 7 pm to 11 pm. To find about attending a Friday night session or for more information about the association call (609) 737-2575. Trails leading from the Interpretive Center take visitors through a mature mixed oak-hardwood forest, young woodlands and successional fields. A nature blind offers quiet observation of birds, deer and other mammals. The natural area supports the spring avens, a rare woodland herb of the rose family. 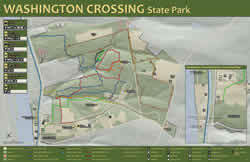 There are 15 miles of moderate trails to enjoy throughout Washington Crossing State Park. These trails are not ADA accessible. April 1 to October 31. Fee: New Jersey Resident $100 per night; Non Resident $200 per night. Campsites B and C accommodates up to 25 people. Fee: New Jersey Resident: $50 per night; Non Resident $100 per night. Campsite D accommodates up to 15 people. Fee: New Jersey Resident $30 per night; Non Resident $60 per night. The Trenton Battle Monument marks the site of the American artillery emplacement that commanded the streets of Trenton during the battle that led to the defeat of the three Hessian Regiments by the American Army at the Battle of Trenton, December 26, 1776. The monument was designed by John H. Duncan, architect of Grant's tomb.